Neem For Gum Disease And Oral Care - What Does Science Say? Can Neem Prevent And Heal Gum Disease? What does science say about neem and gum disease? Researchers already knew that the leaves, twigs and seeds of neem trees have powerful antimicrobial and antifungal properties. The study used a neem mouth gel made from dried neem leaves. A 25% alcoholic extract was prepared from the leaves, and then turned into a gel. Does Neem Really Heal Gum Disease? One group was treated with a mouthwash containing chlorhexidine gluconate. One group was treated with a placebo gel. Already after three weeks the users of neem gel showed the lowest dental plaque levels. They also had the lowest levels of harmful bacteria that are associated with the formation of dental plaque and tartar. The result after six weeks was the same. 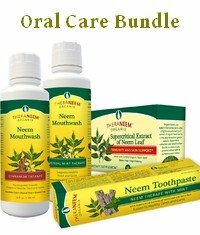 The neem gel clearly outperformed the standard oral care product. What Do Others Say About Neem In Oral Care? After only three weeks 80% of them showed significant improvements. All patients had lower levels of bacteria, and bad breath had disappeared. There were no side effects. Another study in Germany used 70 patients with periodontitis in different stages. The study reports similar results (stop of bleeding and discharge, gums return to healthy color) after only five to ten treatments with neem toothpaste and mouthwash. Most studies were only very small, and not all were properly documented. They need to be repeated with a lot more people. 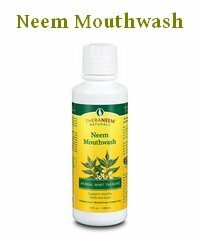 However, neem was clearly shown to be suitable when treating mouth infections and gingivitis. I also read many stories of people who reported absolutely amazing results by switching to an oral care regime using neem products. Reversal of gingivitis, reversal of gum tissue loss... So much so that they managed to avoid already scheduled surgery. If you take the known antibacterial properties of neem and combine them with its traditionally known ability to strengthen the immune system, then those stories sound believable. Neem sure doesn't do harm, and if I can replace fluoride, lauryl sulfate and a slew of other chemicals - that we already know are not good for us - with a natural solution, and dramatically improve the health of my mouth by doing so, I will. By the way, my dentist was impressed with the results, too. I have suffered from bad plaque and calculus build up and resulting gingivitis for all my life. Something in my genetic make up it seems, as it runs in the family. My mother lost all of her teeth to periodontitis at a comparatively young age. I always maintained a rigorous cleaning regime and endured three monthly dentist visits for painful scrapings, but feared that sooner or later I would be losing mine. As I said above, officially there is no cure for gum disease. Today I know better and my fears are a thing of the past. 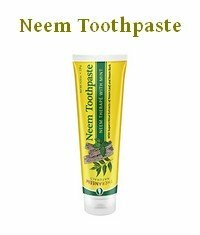 If you have any concerns about gum disease or the health of your teeth, go and get some neem toothpaste today.